Sarah Shuhainor: Finallly exams over. Finally the monthly test is over. I never thought form 4 could be this hard. Seriously I think I should put 200% effort to pass all the exams with flying colours. So so so SARAHHHHHHH! COME ON! YOU GO GIRL! GET 9A+ FOR SPM 2011 ! I'm supporting my selfff again. hehehe. well then who else after all besides my all time motivator loyaa. I lost hope seriously because of few things and and and I lost hope. That is all I know. and I lost hope. :( and the one and only person who supports me 247 a day is of course my GG partner. HAHA. andd I do really hope I get the spirit like I used to have when I was having my PMR yearr. :D and also my mom, she keep telling everything will be just fine . :D I got big dreams since I was a very cute little girl and I keep my dreams until today but as I grow older, I know dreams are not easy to be achieved and before I was very confident but now I'm not sure who am I gonna be one day. whether the person in my dreams or someone I have never been dreaming of. 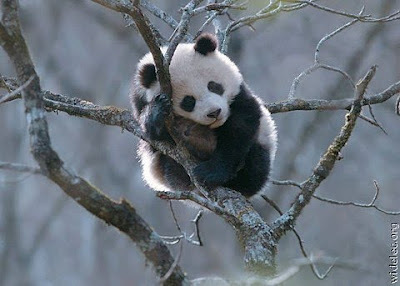 I saw this cute panda and I think this panda is kinda represents me.